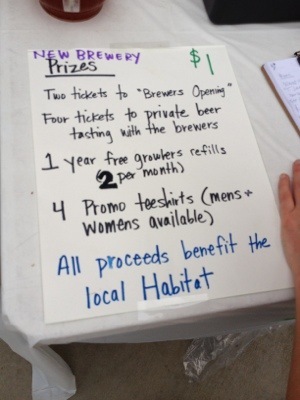 and announcing this Post by Nantahala Brewing Company. I’ll be busy, but I’ll check back on this blog come December. Today is the day I am planning on brewing 35 gallons of lager. As promised, I going to try to update my website with a play by play. A lot can go right & a lot can go wrong. I’ve been preparing all week for this. Every bit of my free time has gone into cleaning, grinding grains, buying extras like ice, food, charcoal for the grill & obtaining over 70 gallons of Love’s Creek Spring Water. without further ado, here we go. 5:15 am: Stumbled downstairs, hooked up propane, fired up the burner for the mash water. Must. Make. Coffee! 5:35 am: Ahhhhh, coffee. Damn it sure is early. 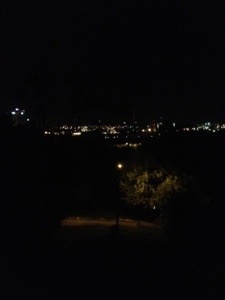 At least I have this view from my back porch as I enjoy this almost fall like morning. 6:19 am: Getting ready to mash in. Hagin just arrived to lend a hand. 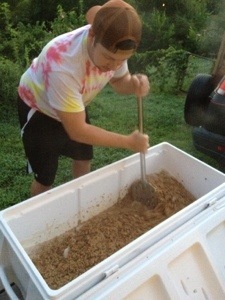 6:35 am: Hagin stirring while we mash in. 6:55 am: Mashed in. Time to smack the packs. 7:00 am. Is it to early for a beer? Not if it has coffee in it. 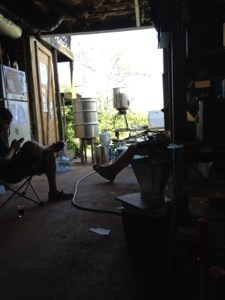 8 am: Waiting on the sparge water to get up to temperature. 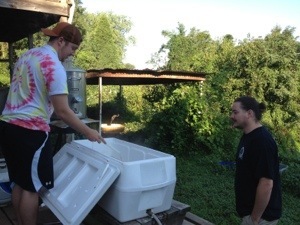 8:40 am: Dalton is here & we are Sparging. 9:45 am. 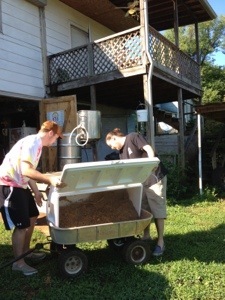 Boil is going on & we are cleaning out the mash tun. 10:30 am: Last hop addition on the Rauchbier, getting ready to stop boil & whirlpool. Got the mash tun cleaned & restocked and the new strike water for Oktoberfest going. Almost time for another beer. So far just me, Hagin & Dalton hanging out. 12 pm: I’ve been to busy to post. 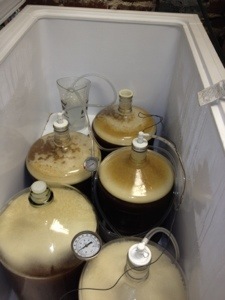 The Rauchbier is going through the chiller into carboys. The Oktoberfest grains are currently mashing. Dalton, Hagin and I are hanging out sampling some brews & waiting for the next step, which is cleaning the brewpot & bringing the next batch to boil when the grain conversion is done. 3:30 pm: Sorry for lack of updates for those following along. The Rauchbier is in the fermenters, the Oktoberfest doesn’t have long left in the boil & several people have shown up with beer. 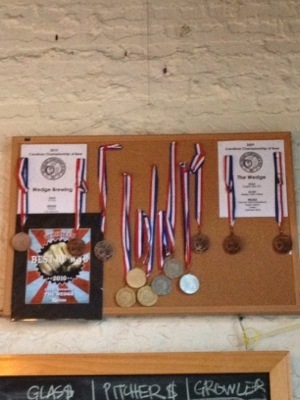 Knox Beer Crew is being represented by Richard Groves & Mark Baggett. Several other friends like Chris Irwin, James Kane & Aaron Russell along with Hagin & Dalton are hanging out. When the next batch is chilled & fermenting, there is still massive clean up to do, hopefully these guys don’t bail when it’s time for that, lol. 3:45 pm: Conversing on the nature of conversation. Deep thoughts. 4:30 pm: Beginning cool down of the Oktoberfest. Should figure out cleaning order, I suppose. 5:30 pm: Done. 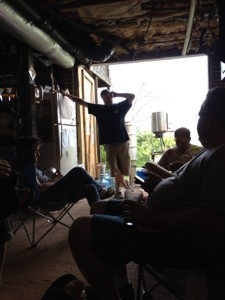 Beer is in the carboys, the big equipment is clean. Finally sitting down. I’m still waiting a little bit before pitching the yeast to the Oktoberfest. I want a beer but I’m too tired to move. Everyone bailed except Richard & Hagin who helped with the clean up. Thanks guys. 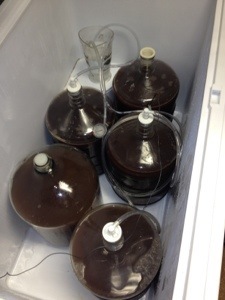 7:30 pm: Everything is clean, the wort is chilled, oxygenated & in the carboys awaiting the magic of fermentation. The guest took off. I am making something to eat & then going to pass out. Thanks for following along today’s post. I might come back & post updates on the status of the fermentation. 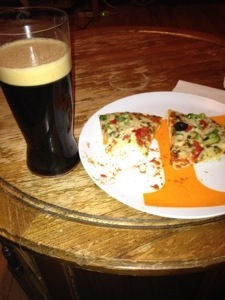 Now I’m going to pass out after I enjoy my reward for all the hard work of today: Young’s Double Chocolate Stout (from the nitro can) & pizza. Goodnight. 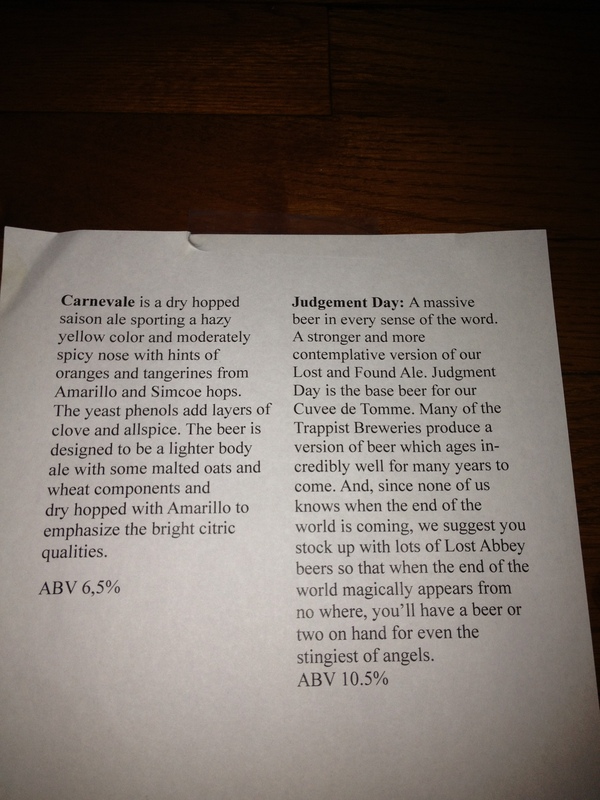 Well here it is Friday, day 3 of my Asheville Beer Week experience. I’ve had a really good time so far. I’ll go ahead and skip the set up and go directly into my recap of yesterday. Started the day by lounging around in the hotel room, trying to get yesterday’s post to load. At noon, I went and saw Men In Back 3 at Carolina Cinemas. It was the best of the 3, really well done and I recommend seeing it. What was really cool about the theater is that they have an amazing draft and bottle selection. 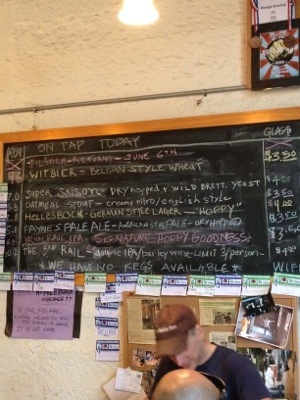 I didn’t want to get started drink too early, so while I admired the list, I actually skipped the imbiding. When the movie ended, I went next door to Wally-World to stock up on Multivitamins and spring water. While I was in the movie, My friend Booze Traveler aka Trader Scott came into town. I drove to Bruisin’ Ales where I met up with him. We sipped a few samples of beer that they had on tap and picked out bottles. I got some pretty good scores that I’ll post a picture of later. I dropped the big ol’ box of purchased beer off at my hotel room and contemplated my next move. I really wanted to go to Hops & Vines in West Asheville for thr homebrewers night, but that would have meant driving. That is one thing I do not do is drink and drive. That’s a set in stone rule as far as I’m concerned. So I elected to stick to events within walking distance. This of course meant the Thirsty Monk where they had a Colorado tap takeover. 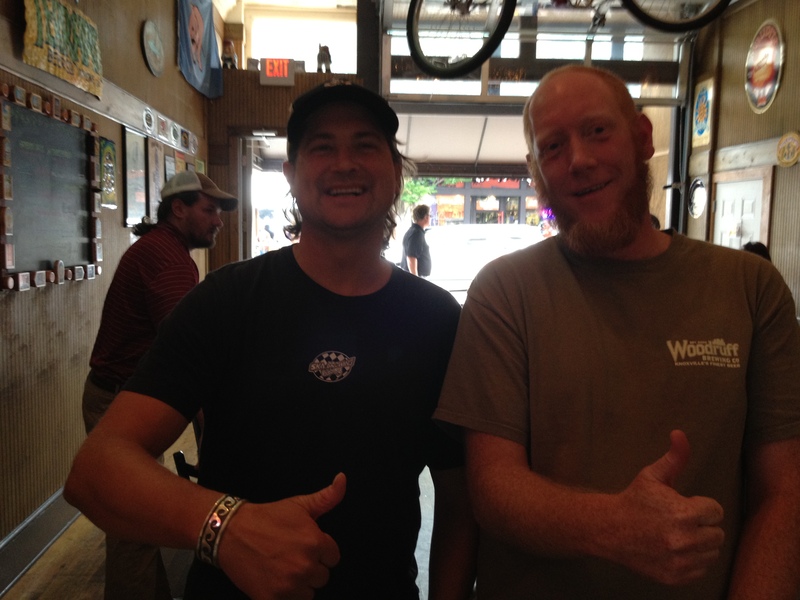 Breweries such as Oskar Blues, Ska Brewing, Great Divide and Breckenridge Brewery had brewers and reps on hand. I scored plenty of bottle openers, sticker and coasters. I met Arlo from Ska Brewing and talked about their beer and the fact that they had thier super limited release of Skaworks Orange on draft at the event. We left the Monk and headed over to Barley’s where we sampled a couple of secret drafts from Lost Abbey. 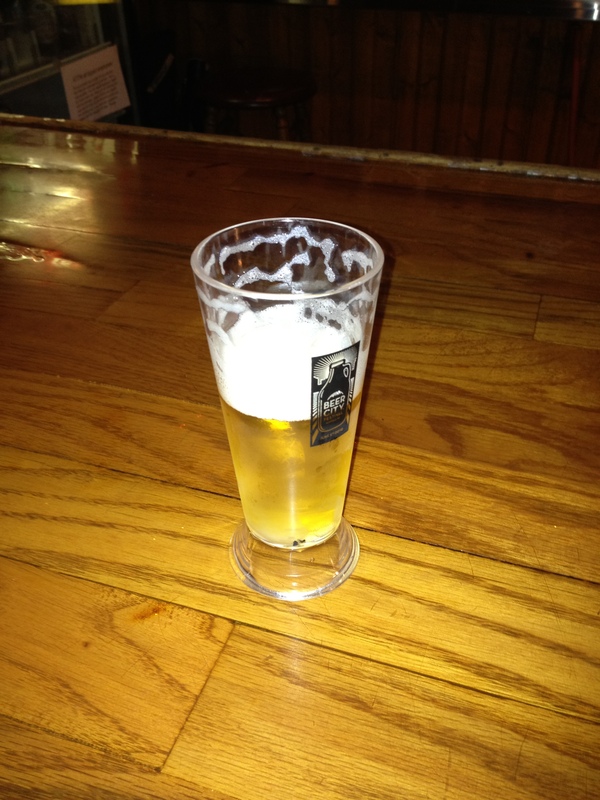 If you went to the upstairs bar and mentioned Untappd, they hooked you up with some free samples. Both beers were incredibly good and incredibly strong. Thank god for sample glasses, because if I would have drank a pint of either of those I would have had to call it a night. I only stayed for the samples so I could head to the new brewery announcement at Wedge. When I go to Wedge, the place was packed. There was a line going out the door for beer. All the Ashevillians I meet really love this place, and I can see why. 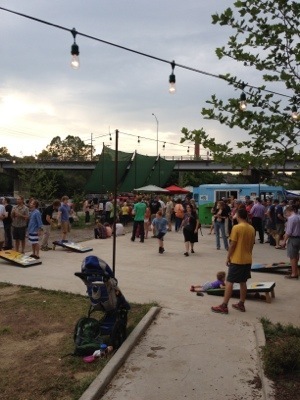 Very cool, laid back vibe and amazing beers. I had a glass of their Oatmeal Stout that I will go out on a limb and proclaim one of the best I’ve ever had of that style. 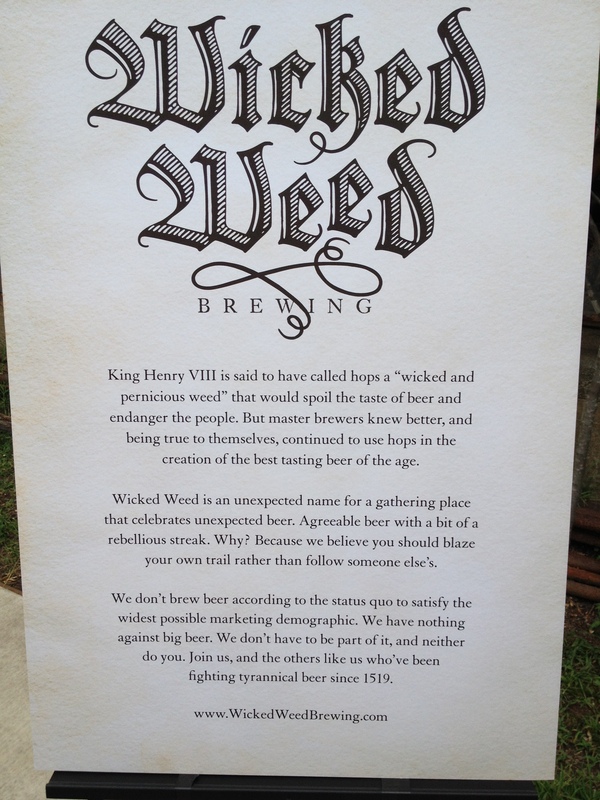 I stayed only long enough to enjoy that one beer, talk a little bit with Cleat from Thirsty Monk, and meet and speak with the owners of the newest brewery, the Wicked Weed. 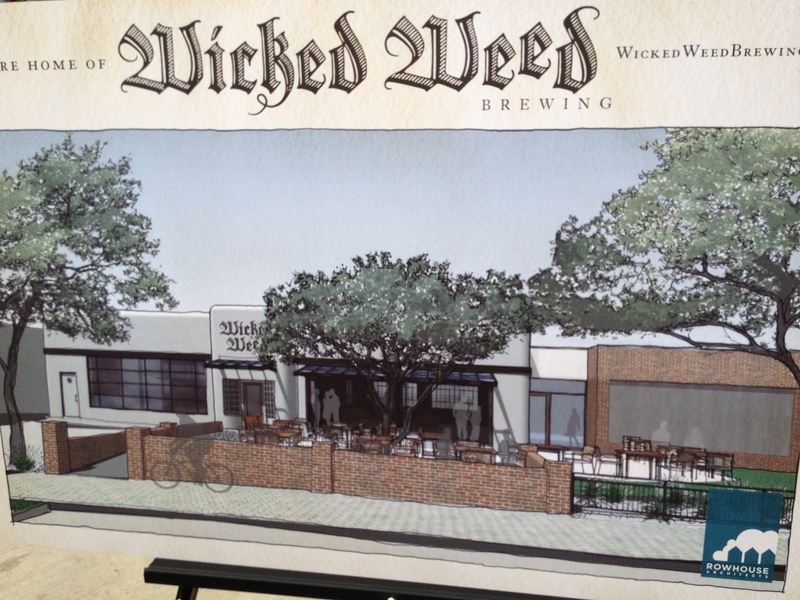 The Wicked Weed brewery will be a 15 barrel system located right next to the Orange Peel. The owners I spoke with said they paln to open sometime in December. I think I just planned a future trip. I wanted to stay longer at Wedge, but I was getting really hungry. I hadn’t ate anything substantial since breakfast. I knew from checking the Asheville Beer Week website that there was a $5 buffet at Lexington Avenue Brewery. I went there for it, and I can only describe it as bizzare. The Buffet was in the back room where the bands play. I asked the doorman if I could check it out before I committed. He said to go ahead, and I walked into one of the most surreal scenes ever. The room was pitch black except for some muted blue lights illuminating a way too loud jazz fusion band. Lounging around is various states of disinterested hipness were honest to goodness beret and turtleneck wearing jazz beatnicks. The “buffet” consisted of 2 pans of unidentifiable stuff that you could only tell was there from the over powering curry smell and the lights from the stage reflected off the metal. The whole scene was weird, uncomfortable and awkward. I turned around and walked out. 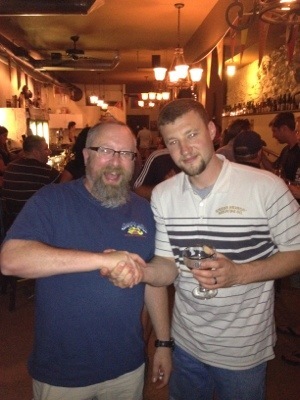 After that fiasco, I met up with Scott at Jack Of The Woods. By then I was tired from all the walking, and worn out from not eating right. I ordered a half pour of Catawba’s Strawberry Rhubarb Berliner Weiss and a half order of nachos. The combination of spicy and sour was more then my empty stomach could handle. I took a few bites, a few sips, and I was done. I boxed up my food, paid my tab and went back and took a long powernap at the hotel. After an hour or so, I was refreshed, so I rallied and met Scott in the hotel lobby where we headed back to, you guessed it, The Thirsty Monk. The place was at capacity, but the doorman was really cool and let us in anyway. We headed downstairs. 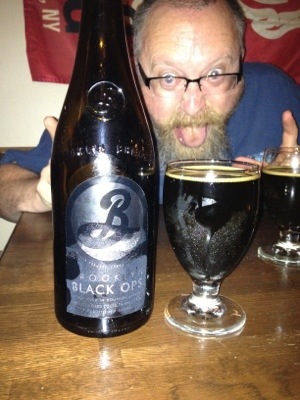 I had a half pour of Ommegang’s Art of Darkness and Scott bought a bottle of Brooklyn’s Black Ops. We sat and conversed for awhile. Last call was made, so we paid our tabs and on the way out I introduced Scott to Brian from Sierra Nevada. All and all it was another great day of my beercation. Which brings me to my survival guide. I am going to make sure to do ALL of this today. 1. Wear sunblock. Though today it’s overcast and calls for rain. So I guess #1 would be Check the weather online and plan accordingly. I plan on getting an umbrella. Number 2, Half pours are your friend. If you are going to be drinking for hours and hours, pace yourself. Number 3, eat something! 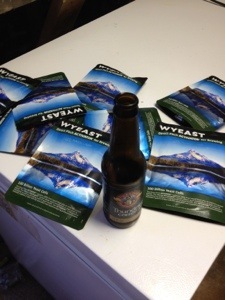 You need a solid foundation for that beer to rest on, multivitamins help, but they are not food. Calories are good if you walk everywhere. Number 4, drink water between rounds, avoid the hangover. Number 5, carry cash. Bars like Thirsty Monk get packed it’s a lot easier to pay for your drinks without having to wait (or make someone else wait) while you pay by card. Number 6, TIP WELL! The bartenders around here are some of the nicest beer loving people in the world. With all the extra people in town for beer week, they are working their asses off. Make sure to let them know that you appreciate them. Alright well this is all for now. I have an ESB brewing workshop at a gardening place to attend, I still have to shave, shower, change and hoof it there. I need to get off the computer, but I will try to upload more pictures as I check back in. This hotel’s interwebs run a little on the slow side. See you around town. I’m looking to meet some of my tweeps and website readers, so if you see me, say hi!